The Japanese is known for its sophisticated culinary art and unique food. I’ve never been to Japan myself and therefore couldn’t boast about having authentic Japanese food. 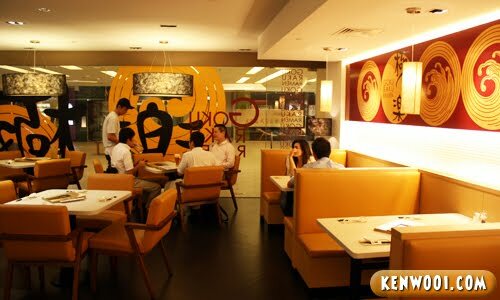 But I ought to believe that dining at Goku Raku Ramen, Mid Valley could be closest to the real experience at Japan. Why would I say so? Well, it’s because their main chef has over 10 years of experience in Japanese food and he’s a Japanese! Despite being in Mid Valley, the shopping crowd would have easily missed this eatery because it’s not located at a “hot & happening” area. To be honest, I go to Mid Valley pretty frequently and I didn’t even know it existed! That’s until an invitation appeared in my mailbox. Being known as The Ramen Haven, the restaurant has an interesting concept – with 3 different sections to accommodate the need of the guests such as an open-space, family-oriented or a private section. It’s cozy wherever you seat. Before the dining session starts, we were introduced to their Japanese chef – Shinichi Kanai. Handsome or cute, I’m not sure which describes him better. What do you think? For appetizer, the Pirikara Negi Char Siew (RM7.90) was served. Char Siew seems Chinese, but with the topping of ingredients and sauce this could be a Japanese reinvention. To enjoy it, the chef demonstrated the art of eating the Pirikara Negi Char Siew. 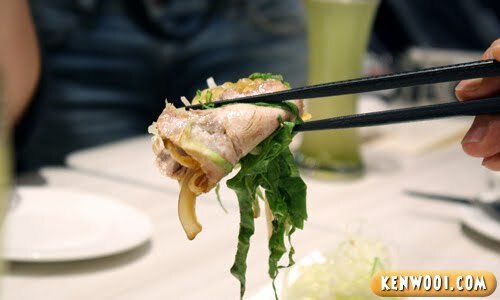 Using the chopstick, wrap a slice of char siew around the toppings and you’re good to eat. It’s cooling cold, a bit spicy and of course, a delightful appetizer dish. Next up, was the Gyoza (RM7.90). 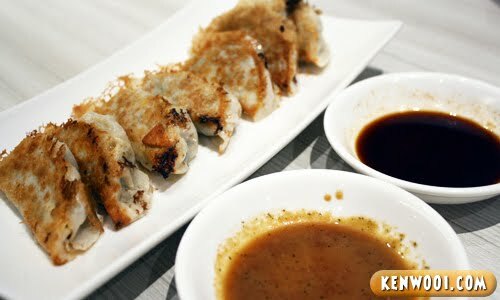 Similar to other pan-fried dumplings, it’s crispy on one side and soft on the other. Goku Raku’s version come with 2 unique sauces to accompany the Gyoza. 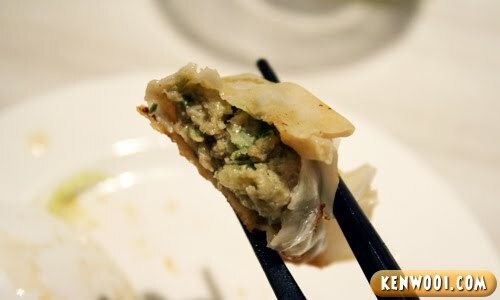 Stuffed with ingredients such as mince pork, garlic, ginger and cabbage, it was a delicious dumpling with the right proportion of meat and vegetable. The Tomato Maki (RM6.90) came next. 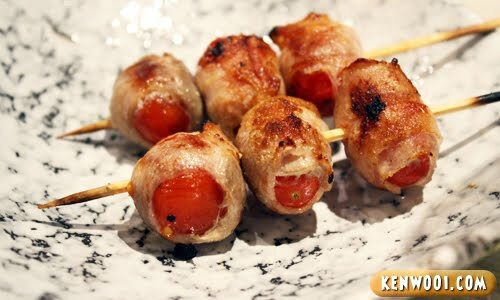 Prepared with cherry tomatoes wrapped with thin slices of pork belly, each of it is skewered like satay. Tastes alright, but not my favourite. After that, we had the Buta Bara Kushi (RM6.90). It’s accompanied by a sauce called the Tonkotsu sauce which is slightly sour. On first sight, it looks like a fish fillet but I was wrong. 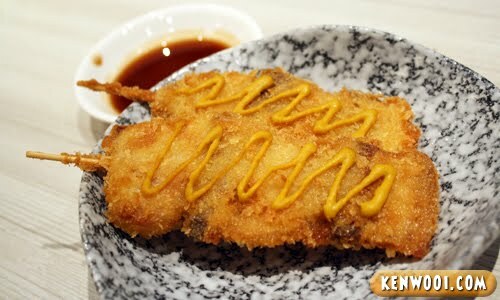 This dish is actually prepared with thin slices of pork belly, coated with bread crumbs, deep-fried, skewered and finally topped with some mustard. Gotta love the tender meat and crispy coating. Served with stone pot, we had the Ishiyaki Garlic Rice (RM16.90) next. 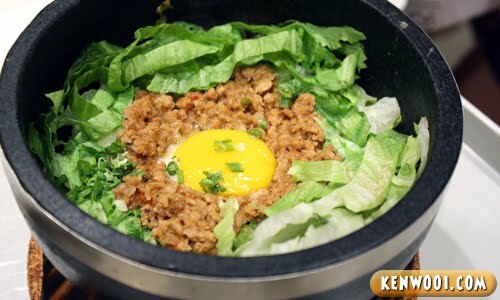 It mainly consists of egg (obviously), mince pork, shredded lettuce, spring onion and lastly added with stamina sauce. I’m not sure why it’s called “stamina” sauce, but that’s what the chef said. Nevertheless, it tastes sweet and slightly spicy. He even mixed the rice for us. Great smile, so charming – and I thought Japanese people are expressionless – unless they’re in bed. Get it? No? Never mind. 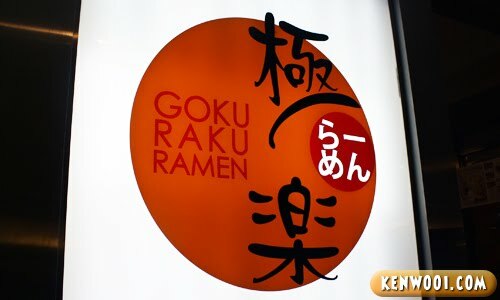 Let’s proceed with the highlight of Goku Raku – its Ramen dishes. 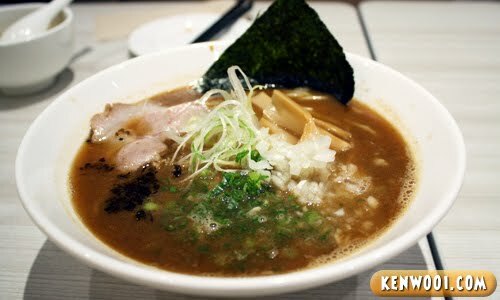 The first ramen was Tonkotsu Ramen (RM16.90). Other than the thin ramen noodles, its topped with a slice of char siew, black fungus and bean sprout. Tastes just okay. 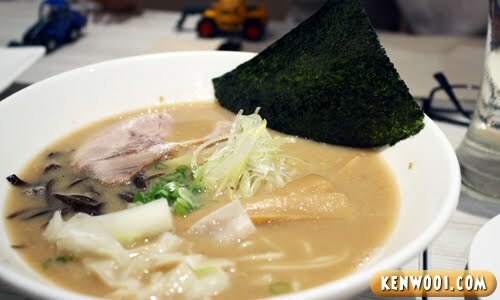 The next one was Miso Tonkotsu Ramen (RM18.90). Almost similar with the first one, the addition of miso gave the soup a stronger flavour. Oh by the way, the soup is boiled for about 17 hours before it’s ready to be served. Wow. This is the Ultimate Tonkotsu Ramen (RM20.90), and it’s my favourite. Topped with char siew, flavoured egg, black fungus, spring onion and leek, I personally enjoy the taste – especially the soup. The combination of the ingredients makes my taste buds happy. On the other hand, its soup is boiled for 30 hours. So ultimate huh? 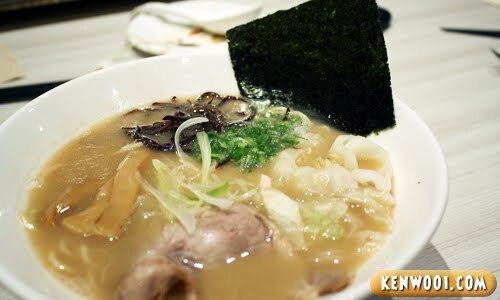 The fourth ramen was the Gokuraku Miso Ramen (RM20.90). With mince pork and cabbage as its main ingredient, it has a thicker soup base and hence it comes with thick ramen noodles. The final ramen of the day was Gokuraku Ramen (RM19.90). Not much different from the previous one, but it is more rich in flavour. Not my #1 but it’s a favourite for the rest. Alright, once we’re done with the main courses, it was time for desserts! 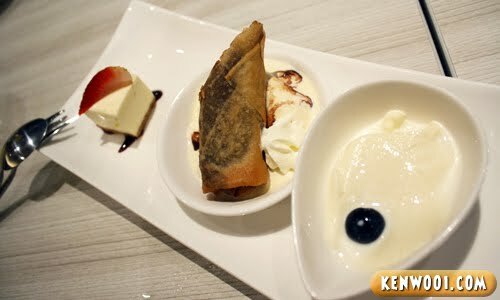 From left to right – Rare Cheese cake (RM8.90), Banana Fritter with Vanilla Ice-Cream (RM8.90) and Annin Tofu (RM6.90). I personally love the cheese cake. It’s delicate, unlike most cheese cakes which are firm, and it tastes so good. I also loved the banana fritter. Having it still warm, dipped with vanilla ice-cream is simply delicious! 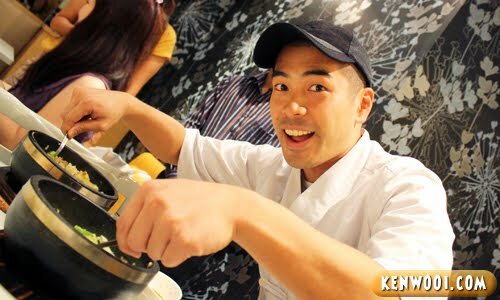 And lastly, I think I’ve fallen in love with Chef Shinichi Kanai too! P/S: There is an ongoing promotion by Goku Raku. 50% off on all ramen dishes on Mondays and Tuesdays! OMG! You have fallen in love with the Japanese chef? So sorry for your girlfriend… and the chef too LOL!! OMG! I also did not know this restaurant existed! Thanks for sharing! 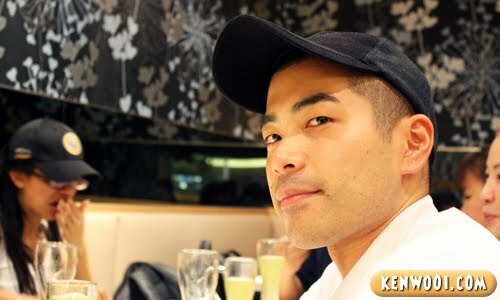 The chef is soooooo hencem! Drool!!! YOU LOOK SOOOOOOOOOOOOO LOVE-STRUCK THERE! I would have gladly try it! So hungry after looking at the food photos!! such a lovey dovey face bro! So many Japanese restaurants around, not enough $$ to try them all. But since it got serve pork, might push it up my to-eat list, haha! Not really a fan of Japanese food…but these look different from the usual stuff and the prices are reasonable…plus the chef IS handsome. LOL!!! 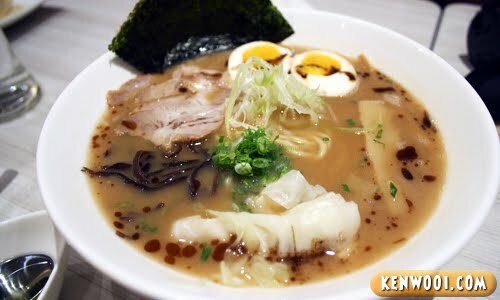 My fav here is the Ultimate Tonkotsu also. Hey you know actually Tonkotsu and Ultimate Tonkotsu is similar.. just got the extra boiled egg and leek/garlic oil. I saw this restaurant when go Mid Valley with my BFF during the Bersih Day :P.. For me, the ramen smell like herbals soup but my BFF said taste very nice oo.. One day I go try lah. The food looks delicious! So does the chef. Oops! Thanks for sharing. Both. i like how slotted in a japanese pr0n reference in there. again you always makan nice nice. They ran out of rare cheese cake when I was there last week!So sad..